Three meat companies process most of the beef that lands in U.S. supermarkets. Some farmers say that gives the companies too much power over the price of cattle. Between the time a cut of steak or pound of hamburger goes from cattle farm to grocery shelf, it more than likely passes through one of three companies: Tyson Foods, Cargill or JBS. According to the U.S. Department of Agriculture, the top four beef processors hold 85 percent of the market share, controlling the beef market to the point that some farmers believe the companies’ clout unfairly influences livestock prices. Last month, the USDA withdrew a rule proposed in the final weeks of the Obama administration that would have made it easier for cattle producers to raise objections if they thought meatpackers weren’t giving them a fair price. Harvest Public Media's Grant Gerlock takes a closer look at the USDA's decision not to go forward with a meatpacking rule. For example, beef producers would have been able to raise a red flag when they felt they were being frozen out of the market. Hog and chicken farmers could have sought protection from abusive contracts. “If you’re only one of two or three buyers as contrasted with thousands of sellers, all you have to do is just blow a gentle breath on that market and you can knock it down,” says Dave Domina, a Nebraska lawyer who represented cattle producers in a lawsuit against Tyson. The Trump administration has pledged to ease regulations on the agriculture industry — and has done so by killing this proposed rule. “My fear was it would just have been a windfall for litigators and lawyers who wanted to take these court cases and would’ve been very disruptive to the markets and disruptive to the fair competition among producers there,” Agriculture Secretary Sonny Perdue says of not letting the rule go forward. Angus cattle gather for a drink on a Nebraska ranch. 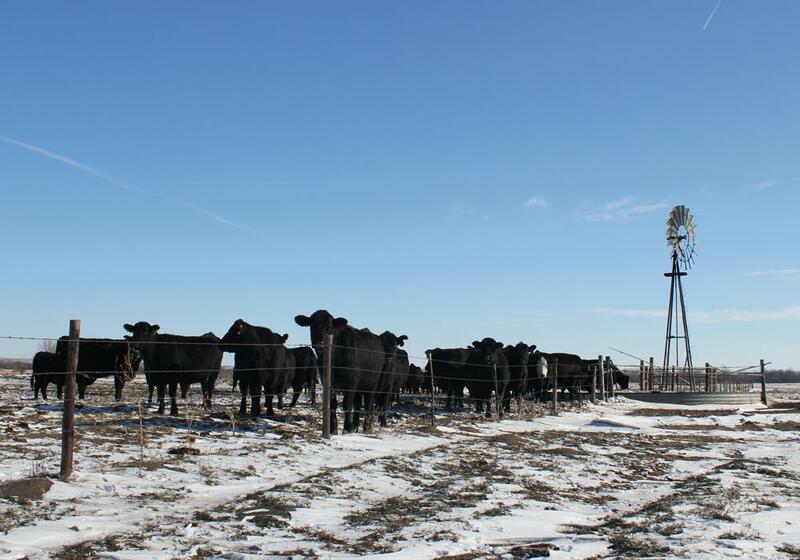 The U.S. lost about half of its feedlots between 2007 and 2012, but about the same number of cattle are being fed, a sign of consolidation in the industry. The work would have fallen to the USDA’s Grain Inspection, Packers and Stockyards Administration, or GIPSA, which oversees data sharing in grain and livestock markets and investigates alleged violations of fair marketing rules. Even without the rule, Perdue says the agency will still be watching to see that the livestock industry is fair and competitive. “I understand those who are disappointed, but I believe that commerce is the answer, not litigation, in the economy,” Perdue says. Without the rule, Domina says, the top meatpackers will be able to further control the supply and price of cattle and other livestock. “This is as though, in the industries affected by the rule, the police force has just been fired,” he says. His reasoning: There is a small window each week where meatpackers bid on cattle. If a farmer doesn’t take that offer, Domina says, there may not be another one. “So you never really knew whether you were going to be able to sell your cattle,” Domina says. And it’s an expensive problem if cattle are not sold at the right time, because if they get too big, the quality of the meat deteriorates and meatpackers dock the price. But there’s an argument from large producers that people who are asking regulators to be more involved in the beef market are out of touch. Not all beef at the store is equal, they say, and neither are all the animals being raised. Many producers work with the major meatpackers to raise cattle that meet certain standards, including livestock that are Certified Angus Beef, raised without hormones or traceable back to birth. Delivering what meatpackers want can fetch producers a better price. “We’re not going to regulate how they buy our product. We’re going to provide them with what they want,” says Craig Uden, who runs a feedlot in central Nebraska and is president of the National Cattlemen’s Beef Association. The USDA rule could have spoiled those incentive programs, Uden says, because regulators could have decided it was unfair for some producers to earn premiums for meeting standards but not others. The incentives work for meatpackers, too, because the supply of cattle is more predictable and is more likely to meet their specifications, according to Colorado State University agricultural economist Stephen Koontz. But there are consequences. “If you drive up and down the road in cattle country you will find lots of small feedlots that have no animals and lots of tumbleweeds,” Koontz says. The number of farms feeding cattle dropped nearly 50 percent from 50,009 in 2007 to 26,586 in 2012, according to the most recent USDA numbers. Most of the livestock farms had fed fewer than 1,000 head of cattle, which is a relatively small amount. The overall number of cattle being fed now is about the same, though, an indication that consolidation is happening in the feeding industry, too. As the USDA allows the beef industry to evolve in a free-market environment, Koontz says, large feedlots and meatpackers have the advantage. Updated 12:30 p.m. Nov. 2 — Sam Clovis, who ran President Donald Trump's campaign in Iowa, has withdrawn his nomination to the U.S. Department of Agriculture's chief scientist position. Clovis was linked this week to the federal investigation of Russian interference in the 2016 election. Gena Kirk did not realize the largest wildfire in Kansas history was closing in on the Kirk Ranch on March 6 until she got a call from her brother-in-law. After realizing that her herd was in danger, she jumped into her pickup and sped up the hill where several of her cattle were grazing. As she herded her cattle onto a green wheat field that would not burn as easily as nearby dry grassland, winds gusting to 60 miles an hour fanned the flames quickly in her direction.